Express your unique style by wearing PANDORA rings to fit any mood or occasion. One by one, each PANDORA ring is rich with color and texture made of 14K gold, sterling silver or PANDORA Rose™ and carefully selected gemstones, stones and pearls. Wear a statement ring or mix and match stackable rings for the perfect accessory to add glamor and individuality to any look. A statement ring is designed to make a bold style statement with confidence. Statement rings usually feature a larger design, shimmering stones, or pops of color that can't help but be eye catching to others. 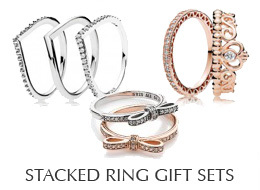 Stackable rings are the perfect accessory to add glamour and individuality to any look. PANDORA stackable rings are crafted to layer beautifully together. Stackable rings offer ever-changing combinations to create your own looks that take you from everyday classic to glamorous occasions.